The first few days after my labour, I spent crying about my labour. I'm extremely lucky to have had a great pregnancy - other than the usual nausea and fatigue in the first trimester, the second and third went very smoothly. I walked every day, did pregnancy yoga and continued illustrating pretty much until the day before I went into labour. 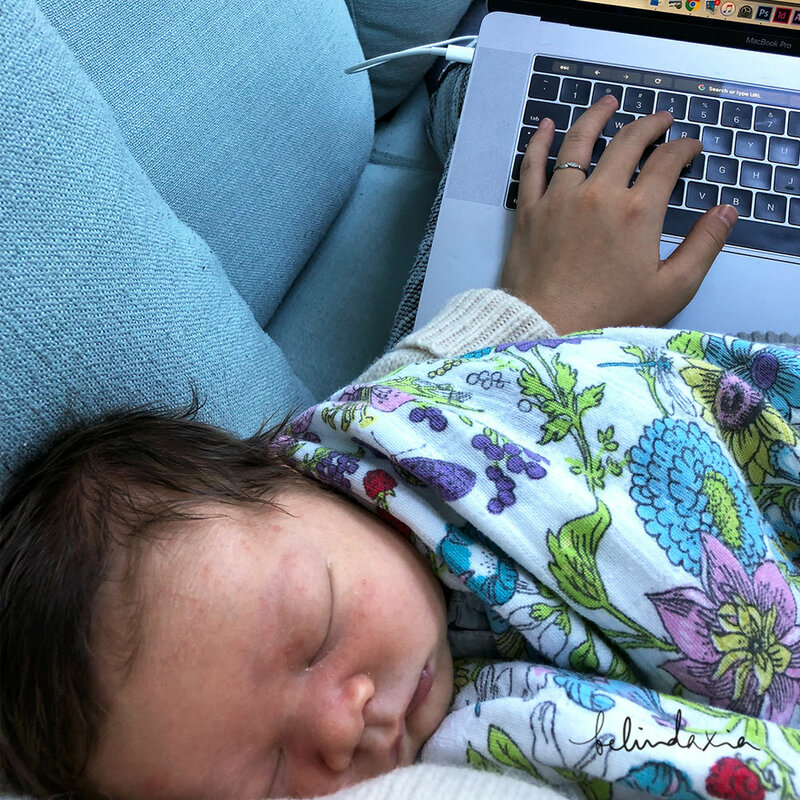 The swelling was minimal, working from home meant the peeing-every-10-minutes thing wasn't a huge issue, and I had no pregnancy insomnia. Everything was textbook. At 38 weeks, I was measuring 36 due to low amniotic fluid, but baby was fine so I wasn't too fussed and to be honest, was glad my belly wasn't as big as it could've been. All in all, not a bad 40 weeks. I had contractions at 1:30am Thursday, notified Josh and went back to sleep in preparation for a big day ahead. But when I woke at 7am, they were gone (and I was a little disappointed). That night after I went to bed, I had another round of contractions begin at 2:30am, but internally rolled my eyes and thought they were another false alarm. But they were still there in the morning - light but constant. I started recording them with the Ovia app and by the time Josh got home at 6pm, they were un-ignoreable. I had some friends kindly bring dinner over and by the end of the meal, I could barely speak through my contractions. By the time I asked for an epidural (I was deliriously in pain at this point, I think it was around midnight), I was 7cm and in my haze, thought I may as well push through. I was offered gas but (again, delirious), told the midwife I didn't want to vomit because vomiting is so much worse than childbirth. She encouraged me to get into the water bath, which I gladly did. The water was nice and hot, a nice distraction from the contractions. When I felt the urge to push, it was sudden and unexpected (I didn't think it would happen so soon) and scary because it was time! After about 2 hours of pushing, I was exhausted. In hindsight, I think the water bath was a tad too hot and I overheated which exhausted me quicker. But honestly, I was too tired to get out by this stage anyway - the contractions wouldn't give me a break. The baby started to get tachycardic, as he'd been stuck for about 2 hours and the midwife eventually made the call to bring in doctors. All I wanted was to get him out - I was too tired to push, too tired to care what was happening/going to happen to my body. I'm reluctant to relive the following bit, partly because I'm disappointed there was intervention in what I wanted to be an all-natural birth, partly because it was incredibly painful without pain relief, but I'm incredibly grateful for the doctors that helped bring my baby into the world. I always think about what happens to women who don't have access to first world healthcare in situations like these. Little Leo arrived in our arms at 4:14am with the help of a vacuum, a full 26 hours after my first contraction. Hallelujah! The swelling and bruising on his face from getting stuck in my pelvis :( Poor little man looks like he lost a punch out. When the midwife sent me in to have a shower, I saw myself in the mirror and looked how I felt. I had literally burst blood vessels in both my eyes and all over my body from pushing so hard, and my entire body was swollen from the water bath, pushing, and the pure exhaustion (by this stage, I hadn't slept for almost 21 hours) - I felt like the loser of a wrestling match and barely registered I now had a baby. I ended up with first degree tears, which I know is lucky, and was walking around in the next few hours. Josh was an absolute champion during my labour - by my side the entire time, holding me, encouraging me, calming me down. To all the support people, you are genuinely appreciated and so, so necessary. I'll never be able to express my gratitude for him, not for a gazillion years. There's no point thinking about what I would change about my labour (though I did for weeks). At the end of the day, I have my Leo, my body has recovered, and life goes forward - because it has to. Physically, I recovered a lot faster than I did mentally. In hindsight, I think my mental state would have been a lot stronger had I heard that labour was hard, rather than the rosy "I had a 6 hour natural labour, and I'm almost back to my pre-baby weight a week later!". Unfortunately, I think the general mentality of women is not to share their difficult stories in fear of scaring other women off having children. But here's the thing - if a women wants kids, a hard labour probably won't deter her - she'll just be more prepared. I think I would have been less disappointed in myself, having "failed" to have a smooth, intervention-less birth. Your body is more capable than you think, and will surprise you. In our antenatal class, our midwife said "Don't think about the contraction you've just had. You will never have that contraction again. And each contraction brings you closer to meeting your baby." Try not to overheat, it will exhaust you even more - there's a reason chewing on ice is a thing. If you plan to have a birth plan, don't be upset if it doesn't go how you want it to. Push. Like. You. Are. Pooping. Remember that at the end of the labour, you will have your beautiful baby. Even if you don't immediately lovingly gush in tears when you see your baby (I was too exhausted, and had no energy to gush), you will still fall in love with your little person and think they're the bee's knees before long. Trust me. And enjoy your sleep before the baby comes. However tired you think your pregnant self is, newborn-owner tired is worse. Much, much worse. But life is much, much better. Leo has changed our lives for the better, despite the sleep deprivation, witching hours, and the multiple times he's peed on us. I can't believe how much I love him, how long I can stare at him for, and despite not having a great labour, would do it again for him.